Background: More than 5 million people die each year as a result of injuries. This accounts for 9% of the world’s deaths, nearly 1.7 times the number of fatalities that result from HIV/ AIDS, tuberculosis and malaria combined. Despite growing awareness of the magnitude of the problem, attention to injury and violence prevention and control among policymakers and those funding global public health programming remains disproportionately low. This kind of study was conducted first time in Indian side of Kashmir. Even the World Health Organization has no data on prevalence of injuries in Jammu & Kashmir. Aims & Objectives: 1. To determine the prevalence of injuries among Kashmiri population in district Srinagar. 2. To find out the pattern of injuries in the study population. 3. To identify various risk factors associated with injuries. 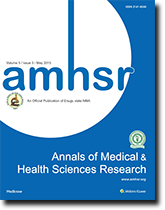 Methods: 655 participants were interviewed in this Community based cross sectional study conducted in Srinagar-the capital city of Jammu & Kashmir state from 1st April 2015- 30th September 2016 using a two stage cluster random sampling method. Results: 19.7% of participants suffered from injuries in the past 1 year. Among the injured 29% suffered from major injuries and 71% from minor injuries. Majority (82.3%) of the injuries were unintentional. Depending on the mechanism of injuries-the most common type were Road traffic accidents (20.9%) followed by Falls (17.8%) and stuck/hit by an object or person (17.8%) and violence (12.9%). The most common place where injuries occurred were at home (46.51%). 15% of injured suffered from a disability. Not a single victim commuted using an ambulance to the hospital from the site of injury. Conclusion: Considerable proportion of those injured, were disabled temporarily for some time which affected their productivity and also became a socioeconomic burden on the society as a whole. Worldwide, injuries and violence are ranked among the leading causes of death and disability. This is particularly true in the case of the lowincome and middle-income countries where injuries and violence are growing in significance, largely as a consequence of the epidemiologic, demographic and socioeconomic transitions that have characterized the development of these countries in recent decades. However, it is in these very settings that vital statistics and routine health information are most likely to be lacking or, at best, patchy. Furthermore, in many low-income and middle-income countries demographic data are often incomplete or out of date. This situation is sometimes compounded by the effects of large population displacements caused by conflict. For these reasons, current estimates of the burden of injuries and violence in low-income and middle-income countries are often based on projections from countries with more comprehensive injury data or on projections from population laboratories. Injuries are the one of the most important causes of morbidity & account for 9% of global mortality but no study has been done in the state of Jammu &Kashmir so far to find out the burden, its pattern and association with various risk factors. This study was conducted first time in district Srinagar. The study helped us to estimate the burden and pattern of injuries along with its association with various risk factors among Kashmiris and thus help in policy making regarding prevention of injuries and necessary intervention. The study also adds information to the World Health Organization since there is no data available about injuries in Kashmir to WHO. • To determine the prevalence of injuries among Kashmiri population in district Srinagar. • To find out the pattern of injuries in the study population. • To identify various risk factors associated with injuries. It was a community based cross sectional study conducted from April 2015- September 2016 in District Srinagar- the summer capital city of Jammu and Kashmir state. Srinagar is situated in the Kashmir valley on the banks of river Jhelum, a tributary to Indus. Srinagar district has a population of 12, 36,829 with total number of 1,91,678 households consisting of 90 wards allocated by Census department on the basis of population distribution. Out of 90 wards 79 are urban and 11 are rural which in fact one of the strengths of the study was where in an urban as well rural population was catered. People of all ages and both sexes who were permanent resident of Kashmir residing in district Srinagar for more than 1 year were included. On residents of Kashmir, people who suffered from disabilities due to other morbidities were excluded from the study. A standard formula was used for calculating the appropriate sample size for a household. Therefore, the sample size calculated using the above formula was 126 households with each household having an average size of 6 as per Jammu Kashmir Population Census 2011. Two-stage cluster random sampling design was used for sampling. Srinagar comprises of 90 wards based on population distribution, out of which we took only 83 wards for sampling as the 7 wards which fall under high security zone are inaccessible due to security reasons and therefore excluded. The population of district Srinagar is 12,36,829 as per census survey report of December 2011 with 1,91,678 number of households. The sampling was done in two stages: In the first stage, we selected 30 wards by using probability proportionate to size sampling (PPS) method. In the second stage, households were selected by using systematic random sampling. We started the survey by selecting a random house as a starting point for the study from each selected ward and then from there moved in a predetermined random direction and took four houses randomly in order to achieve the cluster size. In case the house was locked I moved to the adjacent house. In the last 5 clusters I took 5 households instead of 4 in order to achieve the appropriate sample size. In case of refusal I again moved to the adjacent house. After introducing myself, the person in the household was explained the objectives of the study. A proper written informed consent was taken from all those people in a household who agreed to participate in the study. I made at least 3 visits to the household in order to interview the victim in person, even after that if the victim was not available for interview I interviewed the proxy candidate. In case the victim was less than 12 years, consent was taken from the parent or immediate care taker. For children less than 9 years of age, any one parent was interviewed. If the parent was not available, immediate care taker was interviewed. Risk Factors Which Were Included In the Study were a) Demographic factors (e.g., age, gender, religion, occupation, education); b) Socioeconomic status c) Injury event factors (place, activity, date, time, intent, mechanism, nature, region, alcohol use) d) Injury Related disability-subjective e) Medical care (Sought, place of medical care) f) Post injury impact (effect on usual activities, return to normal activity) g) Injury related death (Place, time of death) h) Injury related disability-objective (transfer ability, Mobility) i) Management of injury (at the scene, at hospital) j)Specific Injury related risk factors (Road traffic accidents, Violence, Suicidal behavior, Poisoning, Fall, Burns, Drowning/near drowning, Object related injuries, electrical energy exposure, Animal related injuries), Helmet, Seatbelt/ Child restraint, Firearm ownership & behavior (Whether carried in person or motor vehicle), Poisoning prevention behavior, Day/Time/ Seasonal variation of Injury, Influence of alcohol, Road conditions & hotspot of injury- Village or City Road/ State highway or National highway, Type of vehicle in road traffic injuries-Pedestrian/ Bicycle/ 2-4 wheeler/ domestic or commercial vehicle. The data was entered in Microsoft Excel and analyzed using SPSS version 20. Frequencies were obtained using descriptive statistics. Chi-square tests were used for finding out relation between socio demographic variables and injury. A p-value (two-tailed) of less than 0.05 was considered statistically significant. This community based cross-sectional study was conducted in district Srinagar of Kashmir valley after approval of protocol by the Institutional ethics committee. A total of 655 participants were interviewed from all age groups in district Srinagar. Majority of them (20.2%) were in the age-group 21-30 years and mean age 34.03 years ± 19.80 years. The study population comprised of 333 (50.8%) males and 322 (48.2) females. Kashmir valley being a Muslim majority division all the participants were Muslims. Among the participants, 290 (44.3%) were single, 329 (50.2%) were married and 36 (5.5%) were widowed. 113 (17.3%) of the participants owned a vehicle. Among the participants who were working 68 (25.9%) were having an income between 0 - 15000 (1st Quartile), 63 (25.1%) were having an income between 15001- 30000 (2nd Quartile), 72 (28.7%) had an income between 30001 - 50000 (3rd Quartile) & 51 (20.3%) had an income of greater than 50000 (Above 3rd Quartile) [Table 1]. The income population had a mean of 41,507.87. 577. Among the vehicle owners 19 (16.8%) owned two wheelers, 2 (1.8%) owned three wheelers and 92 (81.4%) owned four wheelers [Table 2]. (88.1%) participants were interviewed in self, while as 11 (1.7%) were proxy interviews when the interviewee was not available after trying to approach the interviewee three times or some other reasons. 67 (10.2%) were also proxy interviews either cause of age constraints, Intelligence quotient levels or other reasons and therefore were categorized as not applicable in person interviews. Among the relationship with the victim the proxy interviewees 70 (88.5%) were mother of the victim, 7 (9.0%) were father of the victim and 3 (1.5%) were son of the victim [Table 3]. Among the study population 170 (26.8%) were graduates. 195 (29.8%) of the participants were students. 129 (19.7%) participants were injured within last one year from the date of conducting of interview. Out of 655 participants, 91 (13.9%) suffered from minor injuries and 38 (5.8%) suffered major injuries. Majority of major injuries 16 (42.1%) had taken place 3-6 months before the date of conduct of interview. The prevalence of injuries in this study was 19.7% [Table 4]. Table 1: Socio-demographic characteristics of study population. Table 2: Vehicle ownership of the study population. Table 3: Distribution of respondents as victims or proxy. Table 4: Prevalence of injuries in the study population. Among the victims, 35 (27.1%) were involved in vital activities like eating, washing, bathing, using washroom at the time they got injured. Among the victims 27 (20.9%) got injured in a Road Traffic accident followed by fall and struck by a person/object with each sharing 23 (17.8%) to the total. Among the victims, majority suffered from unintentional injuries 102 (82.3%) followed by 16 (12.9%) as intentional injuries i.e., violence and the remaining as self-inflicted 5 (4.0%). 48 (37.2%) of the victims suffered from a cut/bite or other open wounds followed by 23 (17.8%) of bruise or superficial injuries as the nature of injuries. 26 (21.3%) of victims suffered injuries in the lower extremity of the body and among the type of injuries 57 (49.1%) victims suffered from penetrating injuries. The place of occurrence of an injury was mostly at homing in this study [Table 5]. Around 3/5th of injured suffered from a physical disability due to injuries in the study population [Table 6]. Around 4/5th of injured sought medical care [Table 7]. Around 4/5th of injured were affected in their usual activity due to injuries [Table 8]. 80% of deaths took place at the health facility only which may be cause of declaring of death also [Table 9]. Table 6: Distribution of physical disability due to injuries in the study population. Table 7: Status of medical care among the injured in the study population. Table 8: Effect on usual activities post injury in the study population. Table 9: Distribution of place of death due to injury in the study population. Age was closely related to injuries in this study especially in the age group of 14-26 years [Table 10]. Males in the same age group of 14-26 years reported more injuries (30.4%) and over all too males were more injured (61.2%) as compared to females. In our study, among females, less than 14 years and in the age group of 53-65 years relatively (24% each) more injuries were reported as compared to other age groups. Table 10: Relationship between various variables and injury status. Low income (less than Rs/- 15000 or 224.6$ USD per month) or poverty was reported to be more associated with injuries (30.5%) with a spearman’s rank correlation with a value of -0.032 with increase in income which although weak and statistically insignificant but shows a relation. Education had an inverse relation with injuries when we applied modeling, qualification higher than a graduate had an inverse relationship with injuries. In addition, the results also show no significant associations between education and injuries when taken in frequency groups, and this may be due to the lack of statistical power due to the small numbers analyzed in some of the qualification groups. Thus the absence of significant associations does not imply that the effect of education on injury is negligible. Vehicle ownership was related to injuries especially to road traffic injuries in this study. Among the type of vehicles, two wheelers were strongly related to injuries. Among the mechanism of injuries, Road traffic accidents were most common in this study with the prevalence of 4.1% followed by falls accounting to a prevalence of 3.5%. Both Road traffic accidents and falls shared almost the same portion of injuries in this study. Road traffic accidents as the most common mechanism of injury which is in line with this study probably because there are same laws and their enactment to the same level on ground as compared to other countries, which might have a gross difference in ground rules. Close enough falls were the second common mechanism of injuries in this study. This study reported Unintentional injuries (82.3%) to be the most common on the basis of human intent. This study reported extremities (67.2%) especially lower extremity along with foot (31.1%) as the most common region of the body involved in injuries. This study reported cut, bite or other open wounds (37.2%) as the most common among nature of injuries followed by Bruise or Superficial injury (17.8%). This study reported Penetrating trauma (49.1%) as the most common type of injuries followed by blunt trauma (44.8%). Among two wheeler owners 60% were injured in road traffic accidents in this study. Among the injury related deaths 80% took place at a health facility e.g., hospital, clinic, health center or any other health care provider. Among the injury related deaths 50% were internal organ injury and /or Head injury which although occurred at the hospital but the delay in prehospital phase can also be responsible for the same. Injuries are considered the 9th most common cause of mortality in the world and will be the most common cause of mortality by 2030. The prevalence of injuries in this study was 19.7% which is almost similar to the community based study done in other states (viz., Maharashtra) of the country  as well as outside country viz., Sierra Leone with the prevalence of 12.4% by Stewart et al. Age was closely related to injuries in this study especially in the age group of 14-26 years (23.9%). Moore et al. 2014 in United States of America  also reported age as a strong factor influencing injuries especially in 10-19 year olds. Males in the same age group of 14-26 years reported more injuries (30.4%) and over all too males were more injured (61.2%) as compared to females. Moore et al. also reported similar findings from United states of America with a strong predilection of males as 3 times more susceptible to injuries as compared to females while as we found males as 1.5 times higher chance of getting injured as compared to females in Kashmir valley. Males possibly had higher injury rates than females because they were more often exposed to hazards. Similarly, Pant et al. also reported adolescents as the most common age group susceptible to injuries in Nepal. Bartolomeo et al. also reported males as the most common injured gender in Italy. Another study conducted by Moshiro et al. also reported males as more commonly injured as compared to females in Tanzania. Baset et al. also reported males more commonly injured as compared to females in Bangladesh. In our study, among females less than 14 years and in the age group of 53-65 years relatively (24% each) more injuries were reported as compared to other age groups. Bansal et al. also reported injuries most common in the age groups of less than 15 and more than 60 years. Low income (less than Rs 15000 or 224.6$ USD per month) or poverty was reported to be more associated with injuries (30.5%) with a spearman’s rank correlation with a value of -0.032 with increase in income which although weak and statistically insignificant but shows a relation. Socio-economic status plays a major role in determining the magnitude, pattern and severity of injuries and diseases in different countries. Some studies have shown that low socio-economic status is related to injury risk, but the results are non-linear and inconsistent. Poor and rich people tend to be exposed to different risks leading to their injuries. In Srinagar, poor households usually have slippery or rough floors, poor quality kitchens and a low general quality of housing, which expose people to higher risks of injury, due mainly to falls, scalds and fires. Poor adults were at greater risk of injuries at work, possibly because people living under harsh economic conditions may be willing, or forced, to accept jobs that expose them to extremely high risks or unsafe conditions. The relationship between low socioeconomic status or poverty and high risk of injuries is well documented. For example, Plitponkarnpim found a strong negative relationship between child injury mortality rates and gross national product (GNP) per capita at the national level. Education had an inverse relation with injuries when we applied modeling, qualification higher than a graduate had an inverse relationship with injuries. In addition, the results also show no significant associations between education and injuries when taken in frequency groups, and this may be due to the lack of statistical power due to the small numbers analyzed in some of the qualification groups. Thus the absence of significant associations does not imply that the effect of education on injury is negligible. Gotsens et al. also reported almost similar findings in relation to injuries in 15 European cities. Similarly, Laflamme et al. also reported low socio economic background strongly related to injuries. Among the mechanism of injuries Road traffic accidents were the most common in this study with the prevalence of 4.1% followed by Falls accounting to a prevalence of 3.5%. Both Road traffic accidents and falls shared almost the same portion of injuries in this study. Road traffic accidents were reported as most common mechanism of injuries by Bartolomeo et al. They reported road traffic accidents as the leading mechanisms (81%) of injuries. Another study done by Bansal et al. also reported road traffic accidents as the most common mechanism of injury (24%). Similarly, Azubuike et al. also reported similar findings as road traffic accident being the most common mechanism of injuries The studies done in India mostly reported Road traffic accidents as the most common mechanism of injury which is in line with this study probably because there are same laws and their enactment to the same level on ground as compared to other countries which might have a gross difference in ground rules. Close enough falls were the second common mechanism of injuries in this study which was also reported by Stewart et al. Similarly, Duan et al. also reported falls as the most common mechanism of injuries followed by Road traffic accidents as the second. Another study done by Tripathy et al. also reported fall as the most common mechanism of injury. One more study done by Nodrberg et al. also reported fall as the most common mechanism of injury. Olawale et al. also reported falls and traffic injuries as common mechanisms of injuries. The place of occurrence of an injury was mostly at home in this study. Sharma et al. also reported similar results where majority of all major injuries occurred at home (32.3%). Another study from India also reported similar results, Bansali et al. also reported home as the most common place where injuries occurred specially among children & elderly. Similarly, Ghimre et al. from Nepal also reported home was the most common place of injury. This study reported Unintentional injuries (82.3%) to be the most common on the basis of human intent which is coherent with Gosavi et al. who reported 94.0% of injuries as unintentional based on human intent. This study reported extremities (67.2%) especially lower extremity along with foot (31.1%) as the most common region of the body involved in injuries which has been reported also by Stewart et al. in Sierra Leone as extremities were the most commonly injured part of the body. Similarly Dandona et al. reported from Andhra Pradesh as legs to be the most common region of the body injured. Another study done by Verma et al. also reported lower limbs as the most common part of the body injured in Delhi. This study reported cut, bite or other open wounds (37.2%) as the most common among nature of injuries followed by Bruise or Superficial injury (17.8%) which is almost similar as reported by Bansal et al. in Madhya Pradesh, India as cutting and crushing injuries to be the most common among nature of injuries. Similarly, Hedstrom et al. also reported open wounds, abrasions and contusions to be the most common among nature of injuries in Sweden. Close enough Verma et al. also mentioned Superficial injuries as the most common type in Delhi. This study reported Penetrating trauma (49.1%) as the most common type of injuries followed by blunt trauma (44.8%) which is almost similar to that being reported by other studies where blunt and penetrating trauma share a close line. Bartolomeo et al. also reported blunt trauma as the most common type. Among the injury related deaths 80% took place at a health facility e.g., hospital, clinic, health centre or any other health care provider which is almost similar to the findings reported by Radjou et al. who found out that 63% of deaths occurred within a week of consulting a health care provider at any facility. Although, some other studies report majority of deaths in pre-hospital phase. The majority of deaths at a health facility in our study is partly explained by the predominantly urban area in which the study was conducted since primary care centers would have been readily available in the city but on the contrary the time consumption on referral of the victim due to unavailability of advanced life supporting measures in the health care facilities lead to death in hospital phase. In addition, the death also depends on the nature of injuries of the population. Among the injury related deaths 50% were internal organ injury and/or Head injury which although occurred at the hospital but the delay in pre-hospital phase can also be responsible for the same. Another important factor which might influence the high death rate at hospital is bringing the patient to the hospital to confirm the death. The study shows that injuries are an important health problem in Kashmir valley. Obviously the prevalence rate of 19.8% reflects almost one fifth of the population being injured every year. Its prevalence is higher among males (23.7%), adolescents and youth (20.3%) in particular. Road traffic injuries topped the list among the injuries observed in district Srinagar that led to 3.7% mortality and 92.5% morbidity and thus led to disability with adverse socioeconomic burden. Considerable proportion of those injured was disabled temporarily for some time which affected their productivity and also became a socioeconomic burden on the society as a whole. The study also show cased unintentional non-fatal injuries in Srinagar which are not usually considered to be of public health importance. Incidentally, Home injury was found to be the most frequent occurrence in this area, often due to the lack of proper kitchens and hazardous home surroundings. Some prevention strategies might include health education and raising awareness about the possible dangers of injury and the importance of seeking appropriate care following injury. Prevention strategies for avoiding household hazards could include having better light in the evening; making gravel paths around the house and clearing moss to avoid slipping; wearing protective clothing when using electromechanical equipment and improving kitchens. More attention needs to be given to preventing injuries amongst users of motorised vehicles, such as the use of helmets, seat belts, driver education and most important effective laws e.g., issuing driving license after proper examinations. It would be useful to develop methods for protecting pedestrians and cyclists from road traffic accidents, such as having effective separate paths for pedestrians and cyclists, and improving road surfaces to reduce slip hazards. In order to reduce work-related injuries, efforts could include educating farmers on safe working practices, such as not throwing empty glass pesticide bottles into the farm, and wearing shoes or boots when working in wet fields. Community education strategies could help people recognize, demand, and obtain better care and know what they might expect to pay for treatment in private contexts. Developing possible pre-payment schemes for people who are not covered by any kind of insurance in rural areas may also be important, in parallel with promoting health insurance among appropriate sectors of the population, in helping people to reduce the burden of injuries. Injury prevention strategies need to contain combinations of many levels and types of action. Many techniques and methods need to be used, including media interventions, presentation of local data, the publication of other types of information and advice, education of professional groups (as well as members of community and community organizations), supervision through safety rounds and check lists, environmental control, and product development. The first step is to determine the magnitude, scope and characteristics of the problem. The second step is to identify the factors that increase the risk of disease, injury or disability, and to determine which factors are potentially modifiable. The third step is to assess what measures can be taken to prevent the problem by using the information about causes and risk factors to design, pilot test and evaluate interventions. The final step is to implement the most promising interventions on a broad scale. This thesis contributes to the first, second and somewhat to the third step above. It provides a data on the magnitude of injuries in the Kashmiri community. Information on the risk factors and the potential to modify these factors is achieved with the hope that the information will be useful for the last two steps, which must be based on good injury surveys in answer to the first and second steps. Injuries are recognized as an important health problem in Kashmir as well as in many developing countries nowadays. As in other developing countries, the Government of India is faced with seriously inadequate information on injuries for developing and implementing an effective national injury prevention programme. This study was done with intention of contributing results to the Ministry of Health’s injury prevention programme as well as providing a methodology for future injury assessments. I have demonstrated that injury is an important health problem in Srinagar, and identified some specific groups of high-risk individuals and injury types. It was considered important to explore the relationship between risk factors and injuries in a representative sample of population at the community level. The data from this study also allows improved understanding of health service utilization in this environment, with resulting implications for health service policy. The information from different phases in this study should help decision makers and citizens in their efforts to prevent injuries and accidents in Jammu & Kashmir, especially in urban areas. The study may also be valuable as a baseline description for future preventive measures that will need to evaluate changes in prevalence and patterns of injury as well as economic analyses, since any future intervention programme should be evaluated by comparing results with the pre-existing magnitude of problem and the costs of injuries. The injury related morbidity rates reported in this study indicated that injury in developing nations should receive more attention and should be placed higher on the agendas of international health policy. Equity in health and equal access to healthcare are major targets in most health policies. India is in rapid transition from central planning to a market oriented economy. The market-oriented changes have produced great economic growth together with new problems in health and healthcare, such as new risks for traffic injuries or high health care fees. In the transitional period of national development, we should not neglect the possible increasing rates of accidents and injuries along with the process of modernizing society. The problem of injury being the neglected disease of modern society is especially true in today’s developing nations. Thus the results reported here provide a valuable insight into the scope for further health gain in India. This information will assist in taking up the future challenges presented by the current transitional period in Jammu & Kashmir, even in India, as well as in other developing countries, by preventing injuries and by the increasing the use of health services. The linkage between injury epidemiology and cost-effectiveness studies of interventions for this important public health problem is essential. Dr. Rabbanie conceptualized the study, conducted the analysis and composed the manuscript and interpreted the results and revised the manuscript. Dr. Salim interpreted the results and revised the manuscript. All authors read and approved the final manuscript. Professor Muneer-Ah-Masoodi gave precise directions while conducting the study. Peden M, McGee K SG. The Injury Chart Book WHO Library Cataloguing-in-Publication Data: a graphical overview of the global burden of injuries. Geneva; 2002. Gururaj G. Injuries in India : A national perspective. Distribution. 2002;325-347. Organization WH. Injuries violence the facts: The magnitude and causes of injuries. Geneva; 2014. Krug EG, Sharma GK, Lozano R. The global burden of injuries. Am J Public Health. 2000;90:523-526. Sethi D. Guidelines for conducting community surveys on injuries & violence. Geneva; 2004. Hertfordshire U. Definition of major injuries, dangerous occurrences and diseases - RIDDOR - [Reporting of Injuries, Diseases and Dangerous Occurrences Regulations (HSE31 (rev1))] Internet. 2011. Gosavi SV, Deshmukh PR. Epidemiology of injuries in rural Wardha, central India. Med J Armed Forces India. Elsevier Ltd; 2014;70:380-382. Stewart BT, Lafta R, Esa Al-Shatari SA, Cherewick M, Burnham G, Hagopian A, et al. Burns in Baghdad from 2003 to 2014: Results of a randomized household cluster survey. Injury [Internet]. Elsevier Ltd; 2016;42:48-55. Moore JX, McGwin G, Griffin RL. The epidemiology of firework-related injuries in the United States: 2000-2010. Injury. 2014;45:1704-1709. Pant PR, Towner E, Ellis M, Manandhar D, Pilkington P, Mytton J. Epidemiology of unintentional child injuries in the makwanpur district of Nepal: A household survey. Int J Environ Res Public Health. 2015;12:15118–151128. Di Bartolomeo S, Sanson G, Michelutto V, Nardi G, Burba I, Francescutti C, et al. Epidemiology of major injury in the population of Friuli Venezia Giulia - Italy. Injury. 2004;35:391-400. Moshiro C, Heuch I, Astrøma N, Setel P, Kvåle G. Effect of recall on estimation of non-fatal injury rates: a community based study in Tanzania. Inj Prev. 2005;11:48-52. Baset MDK, Rahman AKMF, Rahman A, Mashreky SMR, Shafinaz S. Epidemiology of childhood unintentional injury in metropolitan city Dhaka. Inj Prev. 2010;16:A155-A155. Bansal M, Dalal S. Unintentional injuries in rural area - a. 2013;4:449-453. Berger LD. Injury control: A global view. Oxford University Press. New Delhi. 1996. Lucie Laflamme, Stephanie Burrows MH. Socioeconomic differences. Copenhagen; 2009. Plitponkarnpim A, Andersson R, Jansson B, Svanström L. Unintentional injury mortality in children : a priority for middle income countries in the advanced stage of epidemiological transition. 1999;1993:98-103. Gotsens M, Marí-Dell’Olmo M, Pérez K, Palència L, Martinez-Beneito MA, Rodríguez-Sanz M, et al. Socioeconomic inequalities in injury mortality in small areas of 15 European cities. Health Place. 2013;24:165-172. Laflamme L, Burrows S. Addressing the socioeconomic safety divide : Policy briefing. Health Communication. Copenhagen; 2009. Organization WH. Risk factors. 2013. Azubuike SO, Onyemaka EO. Epidemiology of non–fatal injuries among adolescents in an urban Niger delta community of Nigeria. Int J Crit Illn Inj Sci. 2012;2:180-185. Duan L, Deng X, Wang Y, Wu C, Jiang W, He S, et al. The National Injury Surveillance System in China: A six-year review. Injury. 2015;46:572-579. Tripathy NK, Jagnoor J, Patro BK, Dhillon MS, Kumar R. Epidemiology of falls among older adults: A cross sectional study from Chandigarh, India. Injury. 2015;46:1801-1805. Nordberg E, Kimani V, Diwan V. Household survey of injuries in a Kenyan District. East Afr Med J. 2000;77:240-244. Olawale OA, Owoaje ET. Incidence and pattern of injuries among residents of a rural area in South-Western Nigeria: A community-based study. BMC Public Health. 2007;7:246. Sharma M, Srivastava A, Singh B, Gupta SC. Injuries in rural and urban areas of Agra district: An observational study. Indian J Community Heal. 2013;25:480-487. Ghimire A, Nagesh S, Jha N, Niraula SR, Devkota S. An epidemiological study of injury among urban population. Kathmandu Univ Med J. 2009;7:402-407. Stewart K AA, Groen RS, Kamara TB, Farahzad MM, Samai M, Cassidy LD, et al. Traumatic injuries in developing countries: report from a nationwide cross-sectional survey of Sierra Leone. JAMA Surg [Internet]. 2013;148:463-469. Dandona R, Kumar GA, Ivers R, Joshi R, Neal B, Dandona L. Characteristics of non-fatal fall injuries in rural India. Inj Prev. 2010;16:166-171. Verma PK. Community based Epidemiological study of injury in India. Inj Prev [Internet]. 2012;18: A243-A243. Hedström EM, Bergström U, Michno P. Injuries in children and adolescents – An analysis of 41,330 injury related visits to an emergency department in northern Sweden. Injury. 2012;43:1403-1408. Saadat S, Soori H. Epidemiology of traffic injuries and motor vehicles utilization in the capital of Iran: a population based study. BMC Public Health. 2011;11:488. Radjou AN, Balliga DK, Pal R, Mahajan P. Injury-related mortality audit in a regional trauma center at Puducherry, India. J Emergencies, Trauma Shock. 2012;5:42-48. Sakran JV, Greer SE, Werlin E, McCunn M. Care of the injured worldwide: Trauma still the neglected disease of modern society. Scand J Trauma Resusc Emerg Med. 2012;20:64.